Meet & greet, photo opts., MC. Have Rocky Balboa Lookalike Impersonator at your next event. He has many Rocky Balboa and Sylverster Stallone and Rambo outfits to make your event a huge hit….but don’t worry he will not hit you. He even has Sylvester Stallone’s voice as a Sylverster Stallone lookalike impersonator. 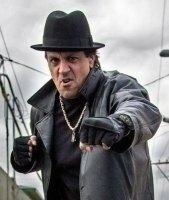 Call Besser Entertainment today to get Sylvester Stallone Lookalike Impersonator to entertain at your next special event…..He is sure to make a huge impact and you and all of your guests will love him. Sylvester Stallone Lookalike Impersonator is ready to entertain at your next party or special event. Sylvester Gardenzio Stallone, nicknamed Sly Stallone, is an American actor, screenwriter and film director. Stallone is well known for his Hollywood action roles. Two notable characters he has portrayed are the boxer Rocky Balboa, the title character of the Rocky series from 1976 to 2008 and soldier John Rambo from the Rambo saga, which ran from 1982 to 2008. He wrote every episode of the two eponymous franchises, and directed some of their installments as well. Born on July 6, 1946, in New York City, Sylvester Stallone is one of the most popular Hollywood action stars of all time, playing such iconic characters as John Rambo and Rocky Balboa. Stallone got his start writing and starring in Rocky. The film was a smash, receiving 10 Oscar nods and winning the award for best picture. Stallone’s career took off from there, gaining action star icon status. In 2010, Stallone starred alongside Bruce Willis, Arnold Schwarzenegger and Jason Statham in The Expendables. In 2012, he reunited with the film’s cast for a follow-up, The Expendables 2. Just one week after it’s premiere, the film had climbed to the No. 1 spot at the box office, bringing in nearly $28.6 million.